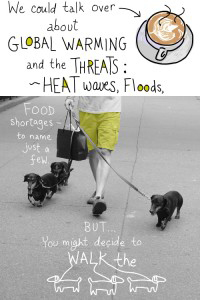 Green T: Spotlight on Climate Change: making it personal. The Green T agenda: Climate change expert, Nobel Peace Prize recipient, and local community leader, Don MacIver, discussed the science and strategy needed to prepare the local landscape for climate change. Franke James, artist and author of the award-winning book, Bothered by My Green Conscience, brought climate change to a personal level by merging science and art to inspire individual action and responsibility. Franke presented Paradise Unpaved, and debuted a new visual essay: What Can One Person Do, When 6.8 Billion are Frying the Planet? 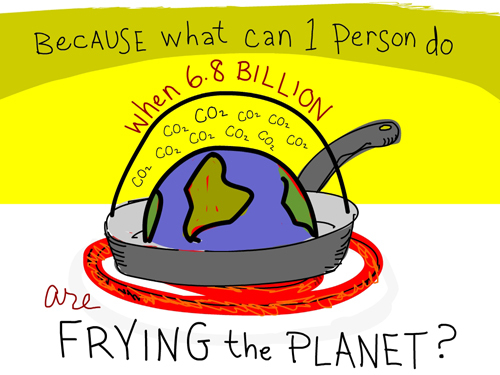 What Can One Person Do, When 6.8 Billion are Frying the Planet?